Spa 35 is launching FDA approved fat injections, Kybella, on November 18th, 2015. Kybella is the first FDA approved non-surgical injection for improvement in the appearance of moderate to severe submental fullness (a.k.a. double-chin). Kybella is composed of deoxycholic acid a chemical naturally produced in the body to help it absorb fat. The FDA approved treatment protocol outlines a series of treatments that can number as high as six. Each treatment can include as many as 50 injections into the submental fat. I'm excited to be a part of the launch of Kybella. Spa 35 clients have long asked for an FDA approved injectable solution for removing fat under the chin without surgery. We'll closely follow FDA and Allergan leadership to ensure our clients get the best results possible within approved protocols. Spa 35 clients considering Kybella will receive a consultation that includes a review of their aesthetic goals and their medical history to ensure they are good candidates for the injections. Clients will be scheduled for a series of injections whose number will be based upon their goals and amount of submental fat to be removed. There are a long number of on line resources for those who like to research new products and services. Below is a You Tube video of Kybella, many others can be found via an internet search. The U.S. Food and Drug Administration today approved Kybella (deoxycholic acid), a treatment for adults with moderate-to-severe fat below the chin, known as submental fat. Using Kybella for the treatment of fat outside of the submental area is not approved and is not recommended. Kybella is identical to the deoxycholic acid that is produced in the body. Deoxycholic acid produced in the body helps the body absorb fats. Kybella is a cytolytic drug, which when injected into tissue physically destroys the cell membrane. When properly injected into submental fat, the drug destroys fat cells; however, it can also destroy other types of cells, such as skin cells, if it is inadvertently injected into the skin. The safety and effectiveness of Kybella for treatment of submental fat were established in two clinical trials which enrolled 1,022 adult participants with moderate or severe submental fat. Participants were randomly assigned to receive Kybella or a placebo for up to six treatments. The results showed that reductions in submental fat were observed more frequently in participants who received Kybella versus placebo. Kybella can cause serious side effects, including nerve injury in the jaw that can cause an uneven smile or facial muscle weakness, and trouble swallowing. The most common side effects of Kybella include swelling, bruising, pain, numbness, redness and areas of hardness in the treatment area. Kybella is being distributed in a dispensing pack that has a unique hologram on the vial label. If there is no hologram, do not use the product. Consumers and health care professionals are encouraged to report adverse reactions from the use of Kybella to the FDA’s MedWatch Adverse Event Reporting program at www.fda.gov/MedWatch or by calling 800-FDA-1088. 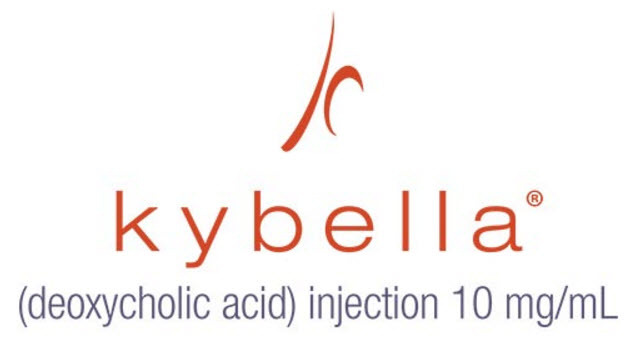 Kybella is manufactured by Kythera Biopharmaceuticals Inc. based in Westlake Village, California.